Associate Research Scientist Wei Hu. 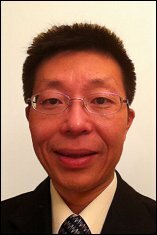 Dr. Wei Hu was promoted from Assistant Research Scientist to Associate Research Scientist on May 2nd, 2013. Hu holds a B.S. degree in aircraft design and M.S. degree in vibration, shock and noise. He has served in the civil aviation industry for four years and obtained a FAA issued airframe/powerplant (A&P) license. Hu completed his Ph.D. in Aerospace Engineering at the University of Maryland at College Park in December 2005. He is a senior AIAA member. His research interests are in dynamics and control of smart structures, with emphasis on active damping control and mine blast protection. He is also familiar with shock analysis and design and shock test specifications. His current research includes development of adaptive crashworthy seat suspension systems and shock absorbers. He has published 1 book chapter and over 20 journal papers. He is a co-inventor on 6 published patents and 1 pending patent. He was the recipient of the Vertical Flight Foundation scholarship in 2005 from the American Helicopter society, the Harry T. Jenson Award (team) in 2011 from the American Helicopter Society for contributions to active crash protection systems for helicopters, and the SPIE Smart Structures and Materials Product Implementation Award (team) in 2013 for the Semi-Active Magnetorheological Seat Suspension System.